Because it’s nice to have something fun to talk about again. 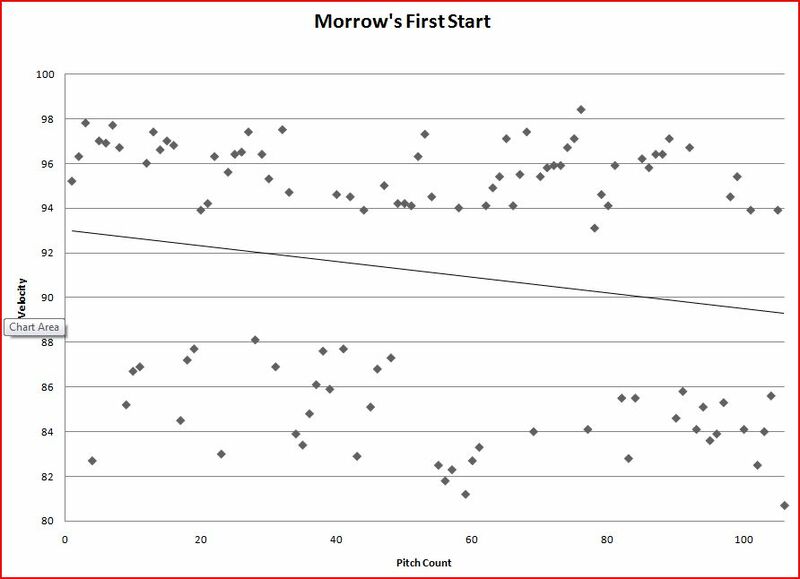 Here’s another graph of Morrow’s pitches as the game goes on, with velocity on the vertical axis and his pitch count on the horizontal axis. I’ve also included the trendline. A few things jump out, but the most obvious is shown best by the trendline, but can also be seen in the density of pitches in each region – as the game went on, Morrow threw more and more offspeed stuff. You can see it’s basically all fastballs to start off, but then he mixes in some slower stuff in the second inning. Then, around the 40 pitch mark, he just starts throwing a ton of breaking balls, going chnage-curve-curve-slider-change-slider in the Damon/Jeter at-bats in the 4th inning. He went back to his fastball later, but then at the end of the game, he was basically Jamie Moyer – 12 of his last 16 pitches were offspeed. His fastballs at that point in the game were also down to the 94 range rather than the 96 MPH heaters he was throwing up an inning before. It is pretty likely that he just ran out of gas in the 8th inning, which is to be expected considering his situation. However, if out-of-gas Brandon Morrow can still throw 94 and has the confidence to work in a bunch of breaking balls, then out-of-gas Brandon Morrow is still twice as good as Carlos Silva. Twice as good? No, really, four times as good. Or more. It feels so good to feel good for a change! This is a really great, informative graph. Well done. 4 times better might even be modest. If you do it on performance per dollar . . .
Yeah, NBarnes just voiced my concern too. This does look an awful lot like how Felix starts a game, throwing mostly fastballs. If Morrow continues that in future starts, the scouting reports will catch up, and teams will just sit on the fastball in the first inning or 2. If that happens, I don’t blame Morrow (or Felix), I blame the organizational pitching mantra of establishing the fastball. Sorry to dwell on the negative. This was a truly great start to Morrow’s starting pitching career. It was one of the brightest spots in this lost season. I don’t worry about the “establishing early the fastball” part at all. This was his first start in the bigs after just a month of minor league ball. I’m sure he had some new “nervousness” about going out there to start but tonight couldn’t have gone better. Let’s let the beauty and happiness of this just sink in a while…there’s been sooo little of that this year. After seeing this…I’ve changed my mind about how quickly the M’s can turn this around. With Felix, Morrow, Bedard, RRS, and Washburn/Silva/Batista/Dickey (whichever is pitching best), I think the starting pitching can carry this team for a while. Re-sign Ibanez as the everyday DH (and not to play the field), find a LF that fly around the outfield, move Clement to 1st, keep working on Jose’s fielding, see if Joh can have a rebound year (not a great year…just not a sucky year), and replace Betancourt with a defensive SS to bridge to Triunfel and I think you start being competitive. That only requires two new players and you don’t have to spend a ton of money on them. That’s very do-able! It pains me to say this but it looked kinda like “establishing the fastball” worked for Morrow. Pipe high 90’s fastballs the first inning knowing he can sneak it past them for the most part. They guys go back in the dugout and let everyone know. The Skankees think all he has are fastballs then the rest of the game Morrow mixes whatever he wants in there. As long as his fastball in the first inning stays his reliever fastball and no one can touch it then it might work. I would love to see next game a 98mph fastball then a sick curve for the first two pitches of the game still. Maybe I am just trying to talk myself in to Morrow being able to succeed with a bad pitching game plan. Yeah, but isn’t the difference that Felix’s four seamer, which they make him use a lot, tends to be straight, while Morrow’s fastballs and Felix’s two seamer have a lot more movement? Unpredictable movement? Establishing the fastball might be a little different for a guy making his first major-league start, I don’t know. He won’t sustain last night’s bafflement but it’s a heck of a way to get started. And it’s so nice to see posts on USSM that don’t make me want to burn the stadium down! It may not be horrible -with the exception of Silva. I wasn’t raining! It’s not raining to say he’s not going to almost no-hit every team he faces for the rest of eternity! For a variety of stupid reasons I spent most of the game driving up and down the Viaduct listening to the radio. It was the first time in a while that I wished I was inside the stadium just a few feet away…. I was amused to see the Replacement Level Yankees blog (“It has been 2871 days, 13 hours, 44 minutes, and 12 seconds since the New York Yankees have won a World Series”) didn’t even have a game thread up. Not surprising for a west coast game against a bottom-dwelling team with the postseason looking out of reach, but I still would’ve loved to read their comments and wallow in the schadenfreude. Morrowâ€™s fastball hummed all night, and the Yankees looked completely overmatched. In the seventh, Morrow struck out Alex Rodriguez on three pitches â€” a curveball (swinging), an inside fastball (looking) and another inside fastball, at 95 m.p.h., for a swinging third strike. Even so, Morrowâ€™s pitch count was a problem for Mariners Manager Jim Riggleman. Morrowâ€™s high in the minors was 82 pitches over six innings last Sunday, and he was scheduled to throw no more than 90 this time. By the eighth, Morrow was tiring. Morrowâ€™s effort was remarkable enough as it was. The last pitcher to carry a no-hitter deeper into a game in his first major league start was Bostonâ€™s Billy Rohr, who lost a no-hitter with two outs in the ninth inning at Yankee Stadium on April 14, 1967. Elston Howard spoiled that bid with a single. I was at the game and it was great, even though I was surrounded by Yankees fans. The most dominating thing I thought about Morrow was his ability to minimize his pitch count, thus actually get to the eighth inning. With how patient the Yankees are, I thought that was the most important part of the game. Also, how many 1st pitch swing and misses did he get. Its seemed to be outrageously high, which means he was fooling a ton of people with those first pitch curveballs. A thought about the handling of Morrow’s career: wasn’t it actually a good idea that Morrow was sent down to Tacoma to start only after he had learned to dominate major league hitters in a closer role? The M’s have a long history of starters who dominate in the PCL and then crash and burn in the majors, or turn into middle relievers, or blow out their arms. Morrow had a real understanding, before he was sent down to concentrate on the transition, of what it takes to get a major league hitter out, and the difference between that and some kid at Portland or Colorado Springs, or some washed up former major leaguer just filling a spot. I’m not saying I’d recommend this to everyone, but it’s at least worth thinking about, particularly given Morrow’s struggles with control early in his career, whether the M’s didn’t in fact handle this correctly. It takes the same thing to get a major league hitter out that it takes to get a minor league hitter out; good pitches. Well, Morrow’s fastball is *better* than Felix’s so, it isn’t quite as big of a deal with him. Felix’s fastball is his third best pitch. Morrow’s fastball is his best pitch. Slightly different situation. Damn, damn, damn, I didn’t get to see or hear the game last night, so THANK YOU (emphasis intended) for giving me a taste of it. Thank God Morrow’s been added to the list of starters. I understand the impulse to give up on the team, not attend games, etc., but this is exactly the reason that impulse doesn’t work for me. There are a few Mariners who are capable of giving you a gem of an evening. It takes BETTER pitches to get the major leaguers out. Otherwise, AAA pitching stats would translate directly to major league stats, with adjustments only for park and not for league level. The point is, that there isn’t some special, different skill that is required to get major league hitters out. You just have to be better at using the same skills that let you get minor league hitters out. Over here in Japan I was actually able to watch the game. Morrow was dominating that lineup. I just hope that that was a sign to come. Why do I see the FO trading him away for some stupid reason. Anybody have any idea if Bedard is done for the year? I am guessing yes but that is my guess.